Waffle House® restaurants and Smithfield® announce a way for customers to recognize their favorite, hard-working server or cook in the first ever “Who’s Your All-Star” Sweepstakes. Customers simply need to snap a picture of their favorite Waffle House Associate, share via Twitter or Instagram and use the hashtag #WhosYourAllStar. Ten Associates will be selected to be on the first-ever Waffle House/Smithfield All-Star Team. The sweepstakes kicks off May 19 in conjunction with the NASCAR All-Star Race at Charlotte (N.C.) Motor Speedway. There, Stewart-Haas Racing driver Aric Almirola will compete behind the wheel of his No. 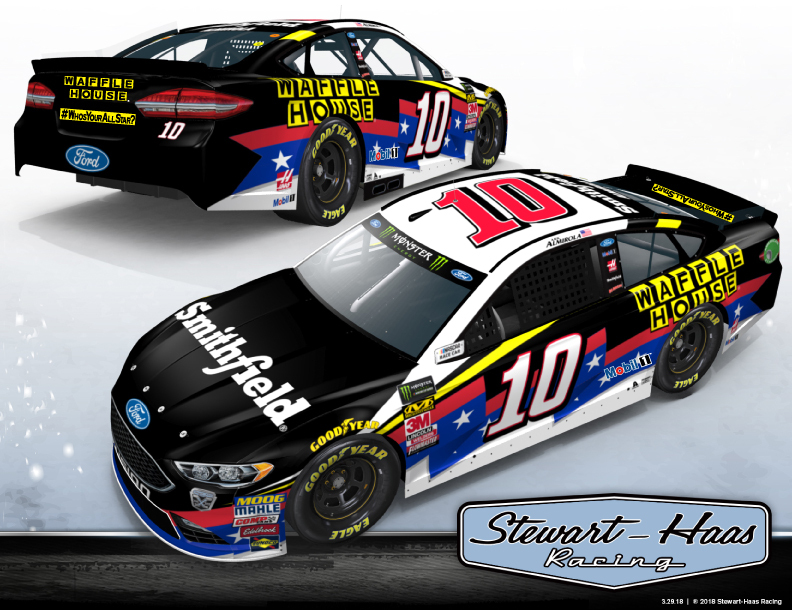 10 Smithfield/Waffle House Ford Fusion featuring the #WhosYourAllStar theme. The top ten Associates and the customers who nominated them will receive special recognition and Waffle House gift cards. One grand prize customer and Associate will each receive a VIP weekend trip to the season-ending Ford EcoBoost 400 in November at Homestead-Miami Speedway. Headquartered in Norcross, GA, Waffle House® restaurants have been serving Good Food Fast® since 1955. Today the Waffle House system operates more than 1,850 restaurants in 25 states and is the world’s leading server of waffles, T-bone steaks, hashbrowns, cheese ‘n eggs, country ham, pork chops and grits. A leading provider of high-quality pork products, Smithfield was founded in 1936 in Smithfield, Virginia, establishing the town as the “Ham Capital of the World.” From hand-trimmed bacon and slow-smoked holiday hams to marinated tenderloins, Smithfield brings artistry, authenticity and a commitment to heritage, flavor, and handcrafted excellence to everything it produces. With a vast product portfolio including smoked meats, hams, bacon, sausage, ribs, and a wide variety of fresh pork cuts, the company services retail, foodservice, and deli channels across the United States and 30 countries abroad. All of Smithfield’s products meet the highest quality and safety standards in the industry. To learn more about how Flavor Hails from Smithfield, please visit www.Smithfield.com, www.Twitter.com/SmithfieldBrand, and www.Facebook.com/CookingWithSmithfield. Smithfield is a brand of Smithfield Foods. Smithfield Foods is a $15 billion global food company and the world’s largest pork processor and hog producer. In the United States, the company is also the leader in numerous packaged meats categories with popular brands including Smithfield®, Eckrich®, Nathan’s Famous®, Farmland®, Armour®, Farmer John®, Kretschmar®, John Morrell®, Cook’s®, Gwaltney®, Carando®, Margherita®, Curly’s®, Healthy Ones®, Morliny®, Krakus® and Berlinki®. Smithfield Foods is committed to providing good food in a responsible way and maintains robust animal care, community involvement, employee safety, environmental and food safety and quality programs. For more information, visit www.smithfieldfoods.com. Stewart-Haas Racing is the title-winning NASCAR team co-owned by three-time Monster Energy NASCAR Cup Series champion Tony Stewart and Gene Haas, founder of Haas Automation – the largest CNC machine tool builder in North America. The organization fields four entries in the Monster Energy NASCAR Cup Series – the No. 4 Ford Fusion for Kevin Harvick, the No. 10 Ford Fusion for Aric Almirola, the No. 14 Ford Fusion for Clint Bowyer and the No. 41 Ford Fusion for Kurt Busch. The team also competes in the NASCAR Xfinity Series by fielding a full-time entry – the No. 00 Ford Mustang for Cole Custer – and one part-time entry – the No. 98 Ford Mustang. Based in Kannapolis, North Carolina, Stewart-Haas Racing operates out of a 200,000-square-foot facility with approximately 380 employees. For more information, please visit us online at www.StewartHaasRacing.com, on Facebook at www.Facebook.com/StewartHaasRacing, on Twitter @StewartHaasRcng and on Instagram @StewartHaasRacing.